I felt like using my favorite teacup–a gift from a Scottish friend–but wasn’t moving gracefully enough. Instead of drinking Boston Tea Campaign darjeeling and feeling good, I let fly some unprintables in our usually quiet morning kitchen, and realized the damage was irreparable, thus no use crying. Plus, crying about a broken teacup makes me ashamed to care about Stuff that much. The root of hoarding lies in the irrational emotional ties to Just Stuff. So I pretended to be mature, rational. I got over it. But didn’t throw out the damn pieces (there were actually many tiny shards, not just the three you see, or I’d a made CC glue ‘er back together). No, three days, and I was back on eBay looking for a suitably decorated (note the delicate gold trim! Not just a plain ol’ band of real gold, but a pattern!) 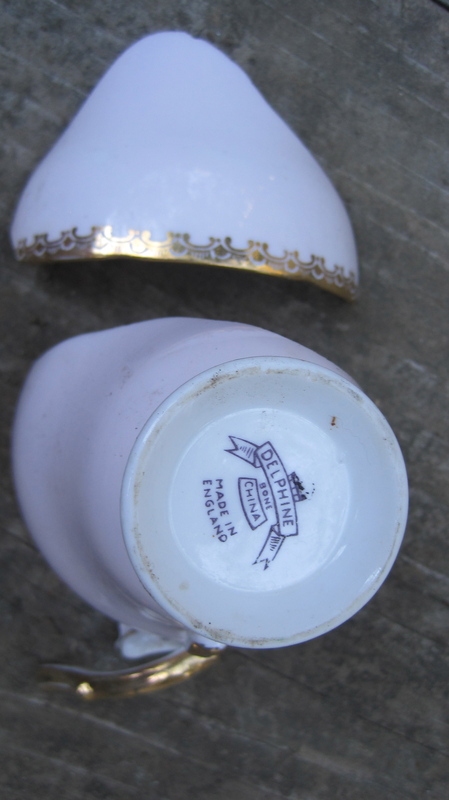 simple Delphine antique cup. Not possible. The one I’d gotten from “Libertopia” in Edinburg was a candle-wax filled pink cup that I safely bore home on the airplane, then froze the wax to free it (success! Without using a chisel or some other dangerous implement)…And had a happy year’s use of the thing. Happy to say I used it dozens of times; didn’t just leave it on a shelf for Sunday best. This is my elegy for a lost cup, a sixty year old tool that was repurposed, then returned to its original use serving Brook Bond Scottish Blend to an American packrat bicycle freak. and only fails when attention fails. Ok sorry, I had to get that one off my chest. The other was the tiny baby mouse in my brother Greg’s tidy house. When I heard a little commotion in the hall (there had been some rodent-oriented action, ever since a mama mouse was caught in a trap the previous day) I raced in to find a confused wee ball of fur running not nearly fast enough across the polished wood floor. Scooping it up in my hand, I said “I’m taking it outside, where it can fend for itself!” (Dumb, in a nice neighborhood where nobody wants to house a mouse). Each house looked too tidy to hide another mouth to feed. So it was off to the park, a block and a half away. I’d felt the thing moving around in the tiny space of my closed fist. I suppose I should have worried about being bitten, but I recognize a toddler when I see one. Toddlers in all of mammalian order are not vicious–they haven’t learned to be feral yet. I opened my hand and…damn, if the thing wasn’t sleeping! On its back. It wasn’t dead, silly. Anyone can tell if an animals asleep. Its sides move rhythmically, and the feet kick a little now and then. Made myself comfortable in the breezy Minneapolis autumn afternoon, watched it sleep, and thought: no rush to wake up, since this is the last time you’ll be safe and warm. My brother drove up, and urged me to come home for supper. The waterworks began unbidden (silent waterworks)…a fat tear escaped as I nudged the thing, and it wobbled off my pillowy hand and into the crisp leaf litter under some roses. Owl food, for sure. Its gait was…toddlerish. 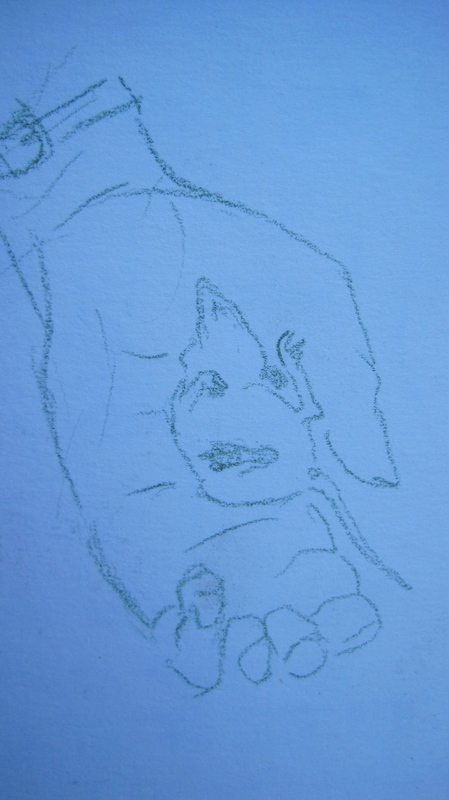 The next day, its little brother appeared, and I repeated the grab-and-carry, but this time it didn’t sleep, it poked its nose through the daylit slits between my fingers. Nephew didn’t want to look at it (sigh), so out I went, and loosed it where little sibling went. This one scampered more, since it was a solid 24 hours older (that is a lot in mouse years), and I hoped it might live. ~ by jacquiephelan on October 7, 2012. It’s not hard to see your love for nature. I would have done exactly the same, JP. If I see a bumblebee motionless on the ground, I always try to put a drop of honey next to it, because I want it to be able to recharge and return to its hive. When a wasp finds its way into my office at work, I’m not the one who jumps up exclaiming ‘squash it!’. I’m the one who captures it and takes it back outside. Hello Bex! Thanks for the note, and yes, I think of critters fondly. Hope all’s well by you, eh? I bet the baby mouse’s whiskers were about the cutest things in the world. I love rodent whiskers. If I ever see a rat washing its face, I just have to watch him until he’s done. It’s just that darling!